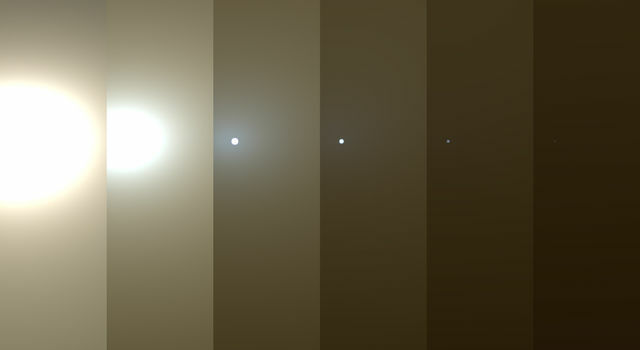 This image shows how dust has enveloped the Red Planet. NASA's Mars Reconnaissance Orbiter shows views of Valles Marineris chasms (left) and an autumn dust storm in Acidalia (right) and the early spring south polar cap. This image from NASA's Mars Reconnaissance Orbiter shows a fierce dust storm is kicking up on Mars, with rovers on the surface indicated as icons. This frame from a movie clip of hundreds of images from NASA's Mars Reconnaissance Orbiter shows a global map of Mars with atmospheric changes from Feb. 18, 2017 through March 6, 2017, a period when two regional-scale dust storms appeared. This graphic overlays Martian atmospheric temperature data as curtains over an image of Mars taken during a regional dust storm. Temperature data and global image were both recorded on Oct. 18, 2014, by NASA's Mars Reconnaissance Orbiter spacecraft. These images from the Context Camera on NASA's Mars Reconnaissance Orbiter were taken before and after an apparent impact scar appeared in the area in March 2012. Comparing the images confirms that fresh craters appeared during the interval. A large new crater, seen by NASA's Mars Reconnaissance Orbiter, appear slightly asymmetric in shape, and measures 159 x 143 feet (48.5 x 43.5 meters) in diameter, making it the largest new crater detected on Mars by MRO to date. This April 6, 2014, image from NASA's Mars Reconnaissance Orbiter was taken as a follow-up to discovery of a possible 2012 impact scar in images from the orbiter's Mars Color Imager. It reveals two craters within the darkened area (center of rectangle). These two images taken one day apart by the MARCI weather camera on NASA's Mars Reconnaissance Orbiter reveal when an asteroid impact made the scar seen in the right-hand image. This March 20, 2014, image from the MARCI camera on NASA's Mars Reconnaissance Orbiter has a dark spot (at center of rectangle) noticed while the image was being examined for a weather report. A regional dust storm visible in the southern hemisphere of Mars in this nearly global mosaic of observations made by the Mars Color Imager on NASA's Mars Reconnaissance Orbiter on Nov. 25, 2012, has contracted from its size a week earlier. This nearly global mosaic of observations from NASA's Mars Reconnaissance Orbiter on Nov. 18, 2012, shows a dust storm in Mars' southern hemisphere. Small white arrows outline the area where dust from the storm is apparent in the atmosphere. This global map of Mars was acquired on Aug. 5, 2012, by the Mars Color Imager instrument on NASA's MRO. One global map is generated each day to forecast weather conditions for the entry, descent and landing of NASA's Curiosity rover. This global map of Mars was acquired on Aug. 4, 2012, by the Mars Color Imager instrument on NASA's Mars Reconnaissance Orbiter to forecast weather conditions for the entry, descent and landing of NASA's Curiosity rover. This global map of Mars was acquired on Aug. 2, 2012, by the Mars Color Imager instrument on NASA's Mars Reconnaissance Orbiter. One global map is generated each day to forecast weather conditions for the entry, descent and landing of NASA's Curiosity. This global map of Mars was acquired on Oct. 28, 2008, by the Mars Color Imager instrument on NASA's MRO. One global map is generated each day to forecast weather conditions for the entry, descent and landing of NASA's Curiosity rover. This close-up image of a dust storm on Mars was acquired by the Mars Color Imager instrument on NASA's Mars Reconnaissance Orbiter on Nov. 7, 2007. This image is centered on Utopia Planitia. This image shows the southern high-latitudes region of Mars from March 19 through April 14, 2009, a period when regional dust storms occurred along the retreating edge of carbon-dioxide frost in the seasonal south polar cap. This image from NASA's Mars Reconnaissance Orbiter shows the southern high-latitudes region of Mars from Mar. 19-Apr. 14, 2009, a period when regional dust storms occurred along the retreating edge of carbon-dioxide frost in the seasonal south polar cap. NASA's MARCI acquires a global view of the red planet and its weather patterns every day. This image was taken on Nov. 3, 2008 by the Mars Reconnaissance Orbiter. This is an image of Mars taken from orbit by NASA's Mars Reconnaissance Orbiter. The Red Planet's polar ice-cap is in the middle of the image and the Phoenix Lander is shown as a small white dot. Scientists were anticipating clear skies when NASA's Phoenix Mars Lander arrives on the north polar plains of the Red Planet Sunday, May 25, 2008. This false-color polar map was generated from images obtained by the Mars Reconnaissance Orbiter's Mars Color Imager (MARCI). It shows a large local dust storm that researchers were monitoring on May 25, 2008. Three days after NASA's Mars Reconnaissance Orbiter's Aug. 12, 2005, launch, the spacecraft was pointed toward Earth and the Mars Color Imager camera was powered up to acquire a suite of images of Earth and the Moon. Three days after the Mars Reconnaissance Orbiter's Aug. 12, 2005, launch, the NASA spacecraft was pointed toward Earth and the Mars Color Imager camera was powered up to acquire a suite of color and ultraviolet images of Earth and the Moon. 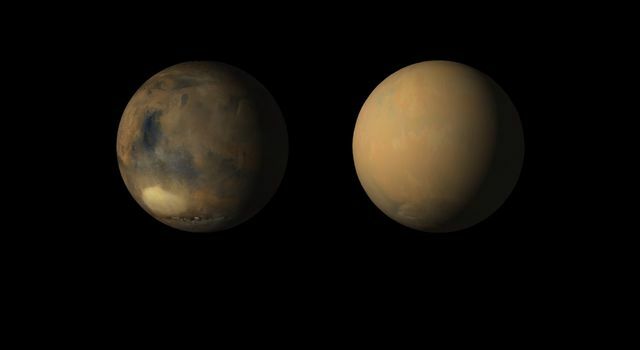 It's the beginning of the end for the huge dust storm on Mars. 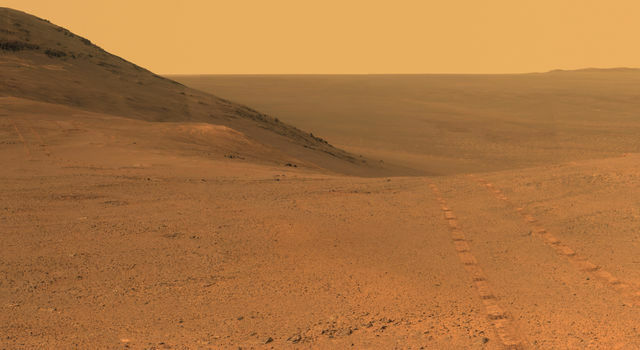 But it could be weeks or months before the Opportunity rover has a chance to recharge its batteries and phone home.